The Singapore race ran true to form, in that in the Monaco of the East, anything can happen, but usually nothing does. Sebastian Vettel made it to the podium in third spot and Kimi Raikkonen was fifth, meaning Scuderia Ferrari finished where it started. At the start, Vettel attacked Verstappen, right with him after the first corner and then getting past at the gentle curve of Turn 6, just before the yellow lights came on, because Esteban Ocon was in the wall. Raikkonen meanwhile had maintained his fifth place off the grid. The restart came on lap 5, with no passing moves. At this stage, Ferrari was mainly focusing on tyre and fuel management. Only after lap 10 did the pace pick up, while on the pit wall, thoughts were already turning to pit stops. Vettel came in for his at the start of lap 15. As he came out, he would have to give it his all to try and pull off the undercut. He took on the Ultrasofts and Hamilton came in for Softs, rejoining still ahead, while Vettel was fighting with Perez. In the pit stop race, the Ferrari had gained a few tenths, but it wasn’t enough. "It’s never easy to come and win even if, obviously, that was our target", said Vettel. "Yesterday the qualifying didn’t go the way we wanted and we couldn’t extract the best out of ourselves. Today, starting from third position, we had to try something different, but it didn’t work out and we finished where we started. "We were running second after a good start which allowed me to get past Max, I was happy and confident when I got the call to box, I knew I needed a mega out lap to try and challenge for the lead but it didn’t work. I lost time behind another car and the brakes got a little too hot, it was close but we got the worse of it. I fully support the team’s decision because, as I am sitting in the car, I can’t be aware of everything that goes on, so I rely on them. Our target was not to finish third, but today we just did not have enough speed." As for Raikkonen, he went long on his stint, while his team-mate got past the Force India on lap 17. But he’d lost a lot of time and he found himself right behind Verstappen as the Dutchman emerged from the pits. The Finn was leading and running a strong pace. Vettel had to cool his brakes before speeding up again. Raikkonen made his pit stop on lap 23 and, unlike Vettel, he fitted a set of Softs, the hardest compound available here. Surprisingly, a few drops of rain fell. Out in front, it was Ricciardo now, who had yet to change tyres, which he did on lap 28, taking on Ultrasofts. At two thirds distance, the leaders came up behind the first of the backmarkers. Raikkonen made the most of it to close on Bottas, but this is Marina Bay and overtaking is a rare sight. 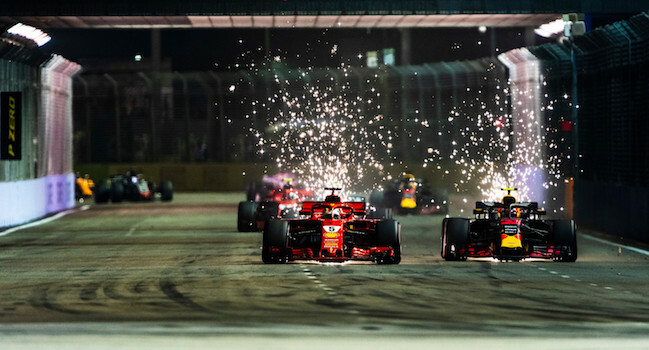 The battle in these closing stages livened things up a bit in the Singapore night, but really, now is the time to think about the remaining six races. "Not much happened today in the race; the car was behaving well and we had a fair speed, but most of the time we were stuck behind somebody and taking care of the tires", Raikkonen explained. "On this track it’s impossible to overtake, unless the guy in front makes a massive mistake. I could see Bottas struggling with his front right tire and locking it sometimes, I could get closer to him but not enough to pass. Through the middle part of the track it was even difficult to follow him because we were losing downforce. In the first stint we stayed out longer hoping for a Safety Car, but it did not happen. "The qualifying here is the key and obviously, when you start behind, your race ends up being a bit boring, getting stuck behind other cars. There was no way we could use our speed. Obviously we wanted more, we did what we could, but this is what we have got today." If you liked this post then share it with your friends on social media websites. You can also follow us on Facebook and Twitter to stay up to date with the latest F1 news.